The team at New World Digital have learned to expect our top man, John Abbott, to be a little sore in the mornings. That’s not sore as in angry. It’s sore as in actual physical pain. It’s because John has recently started a personal training plan, in what he admits is his first regular exercise in about 25 years. A couple of times a week, he’s up at some unearthly hour to meet his trainer, Ciarán Clear of 360 Fitness in Kilkenny. There, he gets pushed through a routine of stretches and sit-ups and weight training and other things he generously calls ‘hell’. It all means that by the time he gets to the office, he’s stiff, sore, and sometimes wondering why he’s doing it at all. He’s sticking with it though, as he knows it will pay off in the long run. He’s realistic enough to know that you can’t start exercising and expect to see results in the first few weeks. And that’s a lesson that also applies to something we all do here each day – Search Engine Optimisation as part of website design and digital marketing strategy formulation. So, how long does SEO take to start working? It’s a fair question. And the answer is – it depends. And many more. Dozens, if not hundreds, in fact. Month 1 – Website audit, keyword strategy analysis, research and discovery, competitor analysis, and further planning. In the case of a relatively small site, this stage can be completed quickly enough for technical changes to also begin in month one. For a large and complex site, this stage may also go into Month 2. Month 2 – Begin the technical SEO work, i.e. make alterations as recommended by analysis of audit results. In some cases, the website may need to be completely overhauled and re-designed, and this in itself can take a month or more. Other SEO activity such as directory submission and social media optimisation can be carried out simultaneously, but you won’t actually see any significant results yet, as they will only being to come once the major changes are finished. Month 3 – The focus by now should really be on content, such as optimised product and company information, blogging, FAQs, etc. This will have started at the outset of the process, but really comes into its own now that the more technical initial work has been completed. You may even start seeing some improvement in rankings by the end of this month, but you can’t necessarily expect them yet. Month 4 – This month brings continued technical optimisation of the site, content creation, and optimisation of the link profile (including getting rid of toxic links). You can normally expect to see improvement in rankings, traffic, and lead generation by the end of this month. It won’t be to the degree that you’ll see further down the line, but it should be enough to let you see that the SEO effort is working. Month 5 – By now, the social media management programme that’s been part of the process all along should really be paying off too. It creates a natural and healthy link profile, drives additional traffic to your site, and can generate leads by itself too. Continued content creation will also help, and you should be seeing a significant increase in visitor numbers and leads. Month 6 – From now on, SEO activities can be consistently focused on content creation – on your site and your social media channels – and on promoting that content. The associated technical work will go hand in hand with this. The specifics will depend greatly on your field of business and what type of website you have. Months 7 to 12 – Strategy now is reviewed, depending on progress so far and what you still want to achieve. We could be going into ‘maintenance mode’, to keep the new high rankings you’re already happy with – or we could be making a final burst to get your site up those last few placings. Either way, the important thing is to continue with the effort, so that the results of all the good work don’t begin to slide. That would be like John reaching his target weight and fitness, but then giving up the exercise, and starting to eat cheeseburgers for lunch each day. Some SEO agencies may tell you they’ll get results for you after four to six months – and that’s generally true. We can tell you the same ourselves. But remember, that’s just when you start to see results, and those results will get better with more time. If you’re seeing results at six months, you’ll see better ones after twelve months. Even if you’re already at number 1 for chosen search terms after six months, you’ll be in a stronger number 1 position after twelve. Think of it as the difference between leading a horse race by a nose, or leading it by forty lengths. 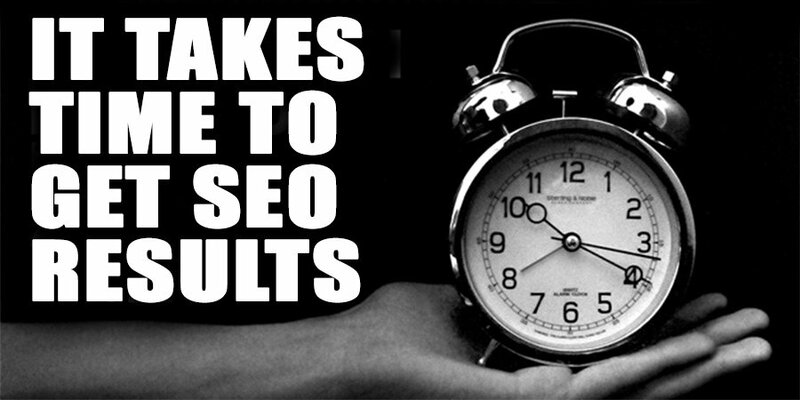 Unfortunately, some companies underestimate the time and effort involved in a successful SEO project. Things start out promisingly, but after only two to three months they decide to stop, because ‘we just weren’t getting the results we wanted’. This means they had unrealistic expectations from the start. Successful SEO is a long process. If you can’t commit to it for a year, then the money you’d spend on just the first two to three months would probably be better off being used in some other way. However, if you make the proper investment, and commit to it for the long haul, SEO delivers one of the best ROIs out there. It’s just like John with his personal training plan. He wasn’t expecting instant results, so he doesn’t mind that he doesn’t yet have the body of a Greek god. But he’s convinced that with continued hard work, he’ll get there.